USGS scientist is measuring various water-quality conditions in Holes Creek at Huffman Park in Kettering, Ohio. The USGS has been measuring water for decades. Some measurements, such as temperature, pH, and specific conductance are taken almost every time water is sampled and investigated, no matter where in the U.S. the water is being studied. Another common measurement often taken is dissolved oxygen (DO), which is a measure of how much oxygen is dissolved in the water - DO can tell us a lot about water quality. Although water molecules contain an oxygen atom, this oxygen is not what is needed by aquatic organisms living in natural waters. A small amount of oxygen, up to about ten molecules of oxygen per million of water, is actually dissolved in water. Oxygen enters a stream mainly from the atmosphere and, in areas where groundwater discharge into streams is a large portion of streamflow, from groundwater discharge. This dissolved oxygen is breathed by fish and zooplankton and is needed by them to survive. A eutrophic lake where dissolved-oxygen concentrations are low. Algal blooms can occur under such conditions. Rapidly moving water, such as in a mountain stream or large river, tends to contain a lot of dissolved oxygen, whereas stagnant water contains less. Bacteria in water can consume oxygen as organic matter decays. Thus, excess organic material in lakes and rivers can cause eutrophic conditions, which is an oxygen-deficient situation that can cause a water body to "die." Aquatic life can have a hard time in stagnant water that has a lot of rotting, organic material in it, especially in summer (the concentration of dissolved oxygen is inversely related to water temperature), when dissolved-oxygen levels are at a seasonal low. Water near the surface of the lake– the epilimnion– is too warm for them, while water near the bottom–the hypolimnion– has too little oxygen. Conditions may become especially serious during a period of hot, calm weather, resulting in the loss of many fish. You may have heard about summertime fish kills in local lakes that likely result from this problem. Water temperture affects dissolved-oxygen concentrations in a river or water body. As the chart shows, the concentration of dissolved oxygen in surface water is affected by temperature and has both a seasonal and a daily cycle. Cold water can hold more dissolved oxygen than warm water. In winter and early spring, when the water temperature is low, the dissolved oxygen concentration is high. In summer and fall, when the water temperature is high, the dissolved-oxygen concentration is often lower. Dissolved oxygen in surface water is used by all forms of aquatic life; therefore, this constituent typically is measured to assess the "health" of lakes and streams. Oxygen enters a stream from the atmosphere and from groundwater discharge. The contribution of oxygen from groundwater discharge is significant, however, only in areas where groundwater is a large component of streamflow, such as in areas of glacial deposits. Photosynthesis is the primary process affecting the dissolved-oxygen/temperature relation; water clarity and strength and duration of sunlight, in turn, affect the rate of photosynthesis. You may have heard about a Gulf of Mexico "dead zone" in areas of the Gulf south of Louisiana, where the Mississippi and Atchafalaya Rivers discharge. A dead zone forms seasonally in the northern Gulf of Mexico when subsurface waters become depleted in dissolved oxygen and cannot support most life. The zone forms west of the Mississippi Delta over the continental shelf off Louisiana and sometimes extends off Texas. The oxygen depletion begins in late spring, increases in summer, and ends in the fall. Dissolved oxygen in bottom waters, measured from June 8 through July 17, 2009, during the annual summer Gulf of Mexico Southeast Area Monitoring and Assessment Program (SEAMAP) cruise in the northern Gulf of Mexico. Orange and red colors indicate lower dissolved oxygen concentrations. The hypoxic zone in the northern Gulf of Mexico is in the center of a productive and valuable fishery. The increased frequency and expansion of hypoxic zones have become an important economic and environmental issue to commercial and recreational users of the fishery. Multi-parameter monitor used to record water-quality measurements. Field and lab meters to measure dissolved oxygen have been around for a long time. As this picture shows, modern meters are small and highly electronic. They still use a probe, which is located at the end of the cable. Dissolved oxygen is dependent on temperature (an inverse relation), so the meter must be calibrated properly before each use. Do you think you know a lot about water properties? Take our interactive water-properties true/false quiz and test your water knowledge. Learn more about dissolved oxygen and related water topics. Lucky for us all, our drinking water is almost always clear (very low turbidity). Other water, such as the creek behind your house after a rainstorm, is likely to be highly turbid—brown with floating sediment. Turbidity is the clarity of water and it is an important factor in water quality. Below are publications associated with dissolved oxygen and water. Rounds, Stewart A.; Wilde, Franceska D.; Ritz, George F.
Rounds, S.A., Wilde, F.D., and Ritz, G.F., 2013, Dissolved oxygen (ver. 3.0): U.S. Geological Survey Techniques of Water-Resources Investigations, book 9, chap. A6.2, https://doi.org/10.3133/twri09A6.2. 'Gulf of Mexico Dead Zone-The Last 150 Years' discusses the dead zone that forms seasonally in the northern Gulf of Mexico when subsurface waters become depleted in dissolved oxygen and cannot support most life. Osterman, Lisa; Swarzenski, P.W. ; Poore, R.Z. 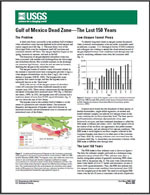 Gulf of Mexico dead zone - the last 150 years; 2006; FS; 2006-3005; Osterman, Lisa; Swarzenski, P. W.; Poore, R. Z. 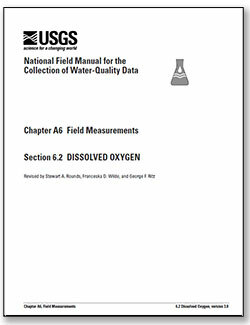 Below are multimedia items associated with dissolved oxygen and related water topics. The Lees Ferry site pictured here is one of six sites on the Colorado River being continuously monitored for dissolved oxygen concentrations. Josh Johnson tests water from the well for dissolved oxygen. The test is one of many performed on site to help the field crew know when to collect samples that will be sent to the laboratories for further testing. Fish need dissolved oxygen to survive in water. USGS scientist measuring dissolved oxygen in a creek, Iowa.